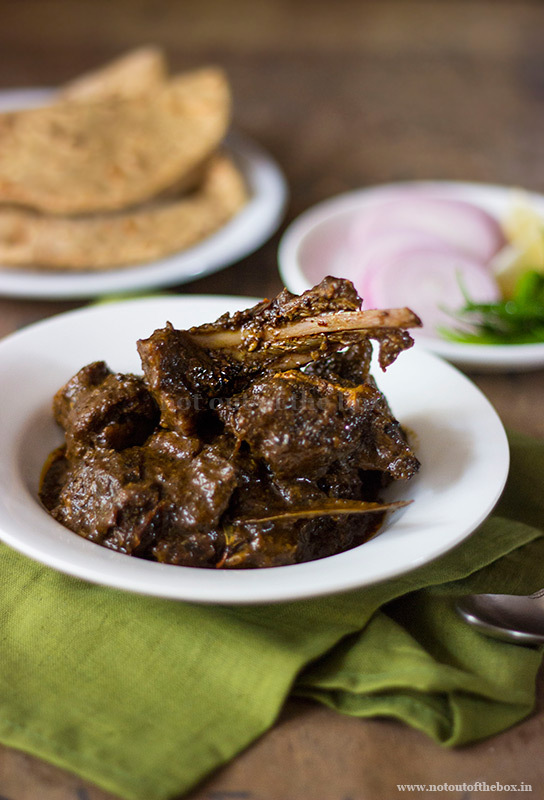 Kosha Mangsho is an age-old Bengali way of cooking Mutton by following the slow cooking method. The word Kosha (a Bengali word) means dryish or a gravy which is quite dry in consistency. It’s a popular dish; every Bengali family cooks it in their own way, so, this recipe may vary a little bit from home to home. I’m sharing my version here. 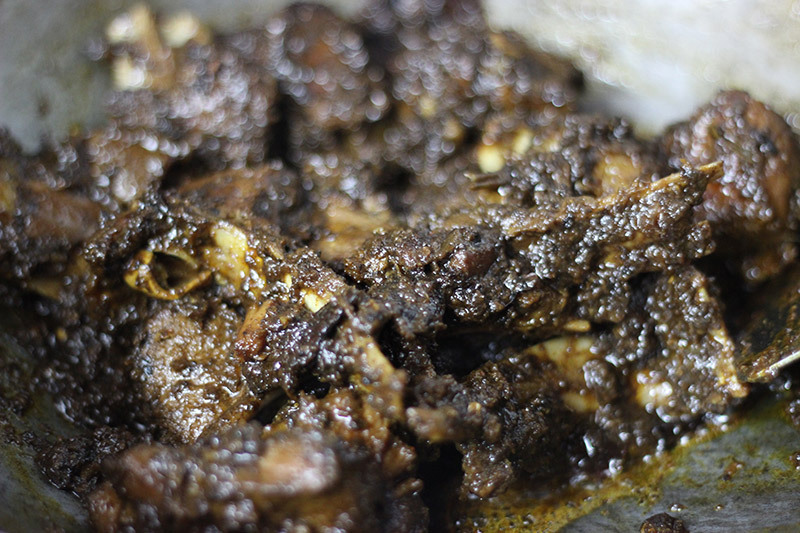 We like our Kosha Mangsho darker in colour, the darker the better for us. My husband is a master when it comes to cooking Chicken or Mutton dishes within the family. So, this time also he did the cooking. And it tasted awesome as always. This finger-licking-good curry with spicy, robust pieces of mutton is truly unmatchable. Try this if you haven’t had Kosha Mangsho before. Marinade the mutton pieces with all the ingredients mentioned ‘For marinating the Mutton’. Keep aside for 3-4 hours. Heat oil in a deep frying pan/kadai (I used an iron wok). Temper with all the ingredients mentioned ‘For tempering’. Now add sliced onions, fry over medium heat until brown in color. Add ginger-garlic paste, mix and sauté for a few seconds. Next to add Cumin powder, mix and fry for a few seconds again. Now add marinated mutton into this. Add yogurt, salt and green chilies. Mix and cook over medium heat for 20 minutes uncovered. Keep stirring in between to prevent burning from the bottom of the pan. If you’re using an iron wok; you’ll see within this time the mutton will start to change its colour. It will turn darker and this happens due to the iron wok only. The colour is too die for, and you’ll not get this colour if you are using any other deep frying pan except the iron wok. But as everybody doesn’t have this kind of wok, so it is perfectly fine if you’re using a regular deep frying pan for cooking the mutton, there will be no difference in taste. After cooking the first 20 minutes uncovered, add one cup of hot water into the mutton. Mix well, cover and cook over low heat until cooked thoroughly. When the mutton pieces are fully done, check salt, adjust if needed. Add sugar and garam masala powder, mix well and remove from the heat. Normally this takes one hour to cook, but sometimes it depends on the tenderness of mutton pieces, so, it may take little less or more cooking time accordingly. The gravy of this Mutton Curry should be thick; a bit of dryish that is the word Kosha stands for. Serve hot with Parota, Luchi (Bengali style deep fried unleavened bread), Puri or it can be served with Pulao also. 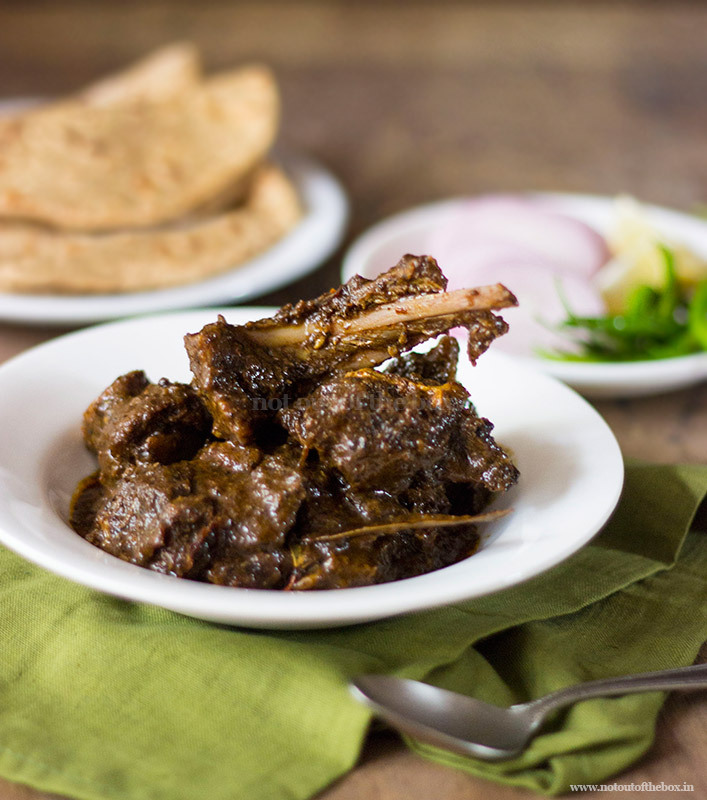 Kosha Mangsho is an age-old Bengali way of cooking Mutton by following the slow cooking method. The word Kosha (a Bengali word) means dryish or a gravy which is quite dry in consistency. 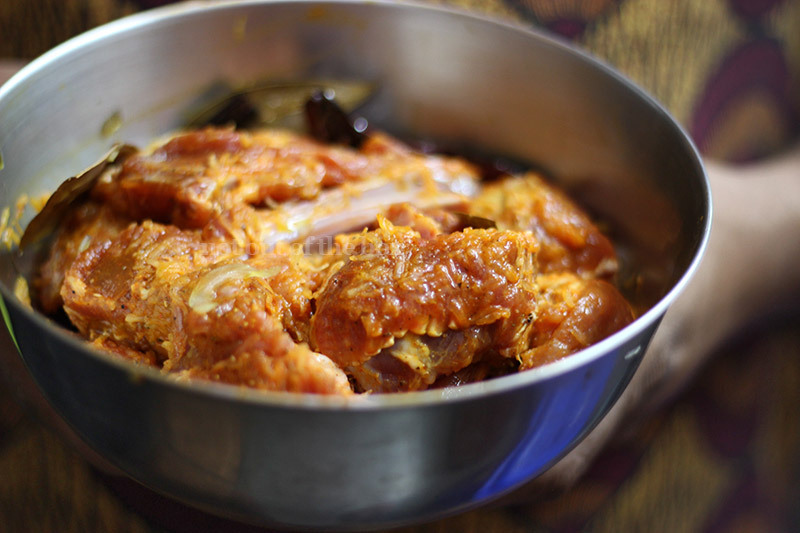 This finger-licking-good curry with spicy, robust pieces of mutton is truly unmatchable. After cooking the first 20 minutes uncovered, add one cup of hot water into the mutton. Mix well, cover and cook over low heat until cooked thoroughly. When the mutton pieces are fully done, check salt, adjust if needed. Add sugar and garam masala powder, mix well and remove from the heat. Normally this takes one hour to cook, but sometimes it depends on the tenderness of mutton pieces, so it may take little less or more cooking time accordingly. The gravy of this Mutton Curry should be thick; a bit of dryish that is the word Kosha stands for. Chandrima….your blog is a delight!! I have been referring to it a lot lately .My husband and I love ‘ Luchi and Kosha Mangsho’ and finding it on your blog was a joy and it turned out great! Just dropped in to tell thankyou for all the recipes you share and keep growing ‘cos you are doing super! Super! This looks like the real deal! I will definitely give this a try. Hi Chandrima, enjoyed going through all your recipes. Will definitely try them out. Made the Kosha Mangsho. It turned out great. We were having a party and my friends just loved it. Didn’t have the Iron Wok though.